A highly decorated captain in the U.S. Army, Luis Montalv?n never backed down from a challenge during his two tours of duty in Iraq. After returning home from combat, however, the pressures of his physical wounds, traumatic brain injury, and crippling post-traumatic stress disorder began to take their toll. Haunted by the war and in constant physical pain, he soon found himself unable to climb a simple flight of stairs or face a bus ride to the VA hospital. He drank; he argued; ultimately, he cut himself off from those he loved. 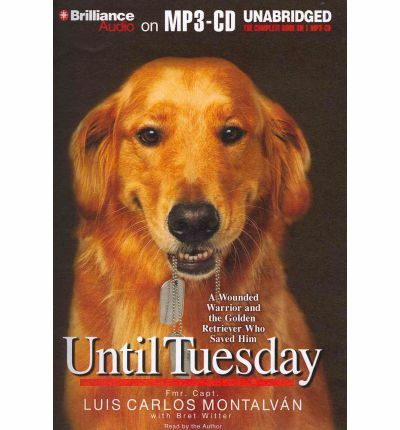 Alienated and alone, unable to sleep or bend over without pain, he began to wonder if he would ever recover.Then Luis met Tuesday, a beautiful and sensitive golden retriever trained to assist the disabled. Tuesday had lived among prisoners and at a home for troubled boys, blessing many lives; he could turn on lights, open doors, and sense the onset of anxiety and flashbacks. But because of a unique training situation and sensitive nature, he found it difficult to trust in or connect witha human being ? until Luis. Until Tuesday is the story of how two wounded warriors, who had given so much and suffered the consequences, found salvation in each other. It is a story about war and peace, injury and recovery, psychological wounds and spiritual restoration. But more than that, it is a story about the love between a man and a dog, and how they healed each other's souls. Note: the structure of this mp3 audiobook is mp3-cd. This indicates it will only play on computers with CD-ROM or DVD drives or CD players that are fitted to play mp3-cds. It can however be copied from a personal pc to an mp3 player like an iphone ipad sony rockbox ipod sandisk or similar player.